In the year 2018, he Government of Aragón pays tribute to José de Nebra (Calatayud, 1702; Madrid, 1768), at 250 anniversary of his death. Without a doubt, one of the most important Aragonese and Spanish musicians of all time: Organist and vice master of the Royal Chapel, author of great popular success in public theaters, major exporter of own music to the Americas, Queens teacher, infants and other illustrious musicians, patron of other artists, Aragonese flattering musicians in court, that propitiate a powerful presence and Aragonese influence on politics and Spanish culture. 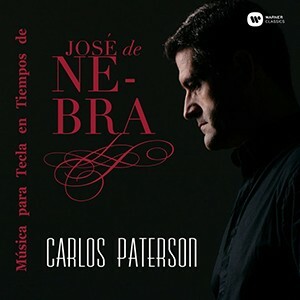 In the present recording is a journey, a mode biographical, some of the most important musical events in the life of José de Nebra, not only through some of his own works for keyboard, but also through other major keyboard works of some eminent composers of his time, as José Moreno and Polo, Jose Elias, Sebastian Duron, José Lidón, Joaquín Oxinaga and Padre Antonio Soler. They exerted some influence on his musical and artistic life. The pieces chosen for this work are mostly unpublished. They work alternate for the three main instruments key moment: the organ, the key and the novelty began to prevail by that time in central Europe, the fortepiano. All instruments used are historical, we have two baroque organs, ONE Calatayud (Zaragoza), hometown of José de Nebra, dating from 1753, and another Villarquemado (Teruel), Also in the second half of the century XVIII. We also have a key French big facelift, of keyboards, built by Reinhard Von Nagel 1996, based on Blanchet, and a fortepiano, based on Walter & son, built by Paul McNulty 2008. Organist, pianist and composer Aragonese, formed in different disciplines in both the Turolense Musical Institute and the Conservatory of Music in Valencia, and by great masters such as Vicent Ros, José Luis González Uriol, Montserrat Torrent, Jan Willem Jansen, Olivier Baumont, Anna Jastrzebska, Nairi Grigorian, Jesús María Muneta, Anton Garcia Abril and Eduardo Armenteros. His concert activity takes place mainly by Spain, Italy, France, Belgium, Germany, Austria, Switzerland and the United Kingdom. Founder of the Cultural Association of Musicians of Teruel and course Bright Magnus Quintet, organizer and member of the artistic committee of the International Piano Competition Antón García Abril, integral member of the Baroque trio Ars Amandi, founder of the ensembles suffering Music Y Bright Magnus Quintet, the latter carries performed several hundred concerts throughout Spain and abroad, and together with a musician who championed the seal Stomvi. He has recorded for Radio Nacional of Spain and for Mary-Water Productions and Warner Classics labels. As musical director has been at the forefront of various groups, as the Municipal Band of Mallen and Coral Group of the Institute of Musical Arts in Valencia. as a composer, would highlight his themes as If thou wilt, remember, played by Daniel Kavanagh; Suite-Sonata para Piano Hugo & Daniela, recorded by pianist Brenno Ambrosini international; chamber music as his In Paradise, released in Summer Concerts 2017 Leuven, and recently carried recording with the prestigious trumpeter Pacho Flores (German Gramophone Artist); and choral and symphonic music as his Crux Fidelis Y Alborada, the latter recently premiered at the Palau de la Música. He graduated in Law from the UNED and Master in musical research by the International University of La Rioja. In the last year he has begun in Brussels a conference program on Music in the Court of Carlos V for Instituto Cervantes. He currently serves as Professor of Organ Conservatory of Music Joaquin Rodrigo From Valencia, Cycle Coordinator Body, Music and Heritage of the Government of Aragon and as a piano teacher at the Institute of Musical Arts in Valencia. This Sunday 25 November Carlos Paterson will give a concert at Castle Alden Bilzen Belgium. Concert dedicated to the school of baroque organ Aragonese, with a chronological selection of works by leading Aragonese Baroque composers that influenced remarkably in the Spanish musical scene and European Baroque. He 14 December a press be held in the Museo Pablo Serrano from Zaragoza. That same evening a concert presentation will be offered in the Seo Cathedral Zaragoza. More information soon.